OK, OK…calm down folks. No need for the tinfoil hat just yet. Since posting the article about the retired NORAD officer making claims about aliens making contacts with humans on October 13th, 2010 (today), there is a lot of buzz going on about it. GhostTheory is seeing some traffic coming from all parts of the world of people searching for “UFOs over new york” or “October 13 UFO”. Other media sites are buzzing with comments from people who claim to be seeing strange lights in the sky today. Most of the reports that are coming in are from Twitter. So that really doesn’t say much other than this is the result of mass hysteria. Let’s see how far along this plays out guys. Looks like balloons to me. What do you guys think? It’s October 13th. Where Are The Aliens? It’s somewhere up on youtube, shouldn’t be hard to find. 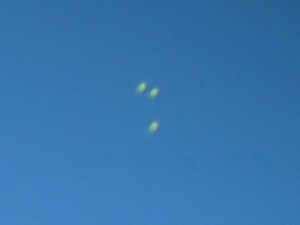 Phoenix Lights were said to be flares. 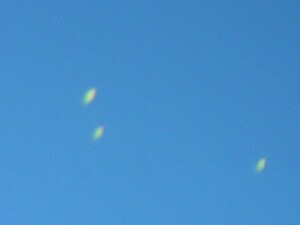 But flares don’t stay at the same altitude and in formation or up to 45 minutes or can cross a whole state of Arizona. IT TAKES ONLY 6 MINUTES FOR A FLARE TO DROP TO THE GROUND. Regular Yellow Balloons in Times Square don’t have tails with blue lights flashing and stay in one spot for at least 2 and half hours by witness interviewed on Fox 5 News. 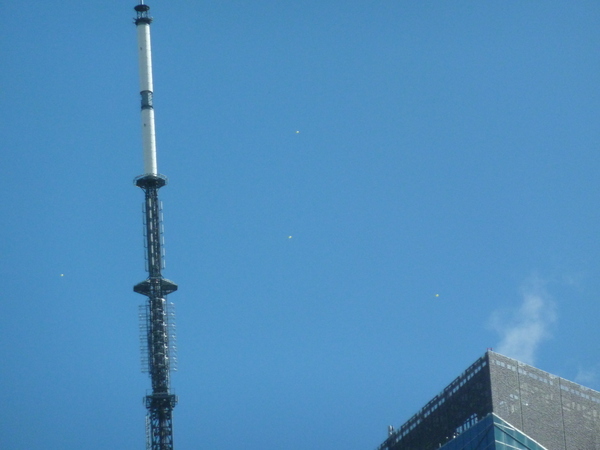 Regular Yellow Balloons couldn’t stay in the same area of Manhattan from Noon to 11 pm on Earthcam cameras…glowing looking like lights in the sky. 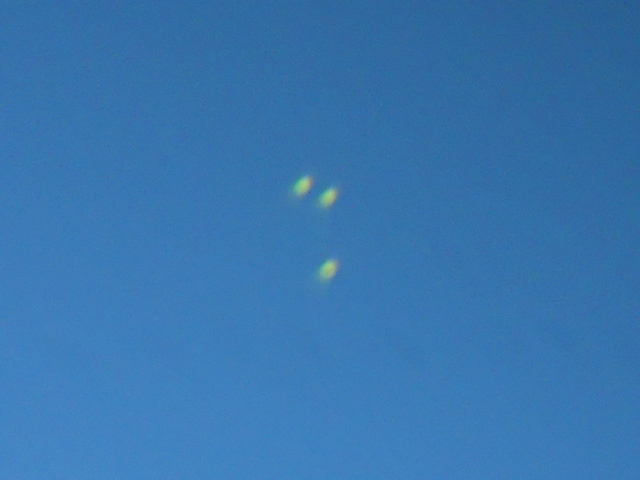 Explain the three bright shining lights hovering in the same spot in Earthcam footage. The NY Daily News was trying to only disprove the story all day. They are not known for fair and balance news. There was reports helicopters flying by, balloons in the air. How are UFO’s dis-proven just because there were other objects in the sky??? Regular balloons in a bunch don’t look like Jellyfish UFO’s. In the past Jellyfish UFO’s were said to be “Swamp Gas” UFO’s are the only ones that can hover in the same spot for hours and look like the northern star in the evening. Except there was reported and seen on the EarthCam three north stars or UFO’s…or engagement balloons with LED lights inside them. Thanks for the definition. But within the context of this\(these) articles UFO’s = aliens, and aliens = extraterestrials. “someone or something which is does not belong in the place it is in”. Also, I must be dumb because it took me like 5 min. to understand that last statement. So, can we go on with our normal lives again? Or is there a message for us earth people from the balloon-aliens? I lean towards it being real, mainly due to the quick to dissmiss articles assuming it was a balloon, with zero doubts. Then the whole ‘story over, move on’ treatment. how did the sighting END? if balloons, they wouldn’t zoom away, or disappear, and if they were ufos, they wouldn’t pop or lazily decend to the ground. how did it end? Answer me please. not ballons – unless they were under RC – these spun around each othere – then flew apart and held a formation….even the FAA said these were unidentified – But i have one piece of advice for them – they should make their manouvers Really whacky – thus putting it all beyond doubt…. Where is the close up on these “balloons” and i was just wondering but didn’t someone wrote a book about UFO visiting new york and coming back a year later to attack it?